Some secrets are so dark you keep them even from yourself. 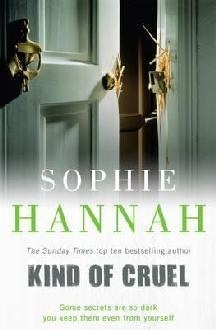 On the surface, Kind of Cruel by Sophie Hannah is a book I should have loved right from the start. I’ll admit, though, it took me a while to get into. First I had to orient myself to the different first-person narratives, and the time shifts in point of view. The change of fonts should have given me a clue that I was dealing with more than one person, but initially I couldn’t “hear” the difference in voice. Looking back, it should have been obvious. In retrospect, too, I can admire the structure that had me wondering, right from the start, what “mystery” I was being presented with. This isn’t your usual crime/detective story; nor is it straight psychological suspense/thriller. Rather, it blends the two genres while interrogating the nature of memory, what constitutes subjectivity and mental illness, as well as the intricacies of troubled human relationships and what keeps us from being entirely honest with ourselves and others. The main character is Amber Hewerdine, a woman whose best friend was killed in an arson attack and who became the guardian of the friend’s two young daughters. She goes to see a hypnotist to help overcome her insomnia, a visit which leads her to become embroiled in a police investigation of another, unrelated woman. This forms the “murder mystery” aspect of the story. The best thing about Amber is she’s cranky and her sleeplessness enables the reader to forgive her for it. She doesn’t suffer fools, behaves badly and speaks her mind; her one redeeming quality is her fierce love of her friend’s daughters. There’s an energy about this character that I found endearing and strangely liberating; it made me think of Sue Austin’s argument in her book, Women’s Aggressive Fantasies: A Post-Jungian Exploration of Self-Hatred, Love and Agency, that a woman’s acknowledgement of her aggressive thoughts can be healing (and a disavowal of them can be psychologically harmful). Kind of Cruel is a clever novel, conceptually, structurally and plot-wise. There’s also something psychologically and emotionally satisfying about it, even though the story it generates is bleak. I’m grateful to members of my Facebook group for psychological suspense fans for recommending it to me.